The Marvel Universe has made its way across multiple formats, existing between the pages of comic books, on television, and across a seemingly ever-expanding calendar of movies. In 2014, Marvel decided to raise the theatrics by partnering with the Ringling Bros’ production company Feld Entertainment to create Age of Heroes, a live action stunt show full of Marvel characters. This year, the band’s all back together for the second edition of Marvel Universe Live: Age of Heroes. The latest iteration of Marvel Universe Live features headlining Avengers like Hulk and Iron Man, along with the Guardians of the Galaxy, Iron Fist, Black Panther, Spider-Man, Doctor Strange and a host of other fan favorites. The group is tasked with returning the Wand of Watoomb back from the nefarious grips of Gamora’s sister Nebula. Thor’s diabolical brother Loki also hatches an intergalactic plan to retrieve the wand and neutralizes one of the most powerful Marvel characters to do so. 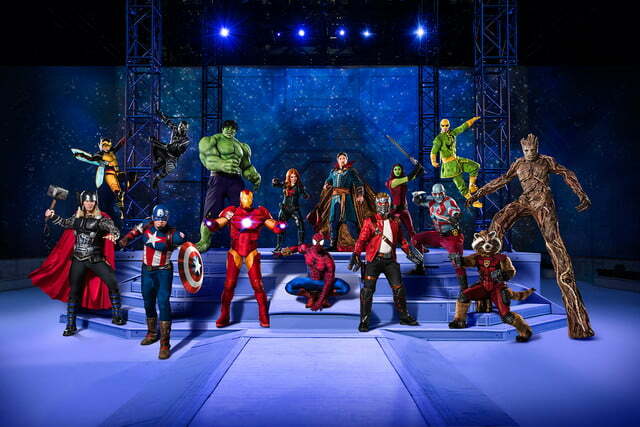 More than 25 Marvel characters appear in Marvel Universe Live and the storyline is entirely original, conceived specifically for this tour. 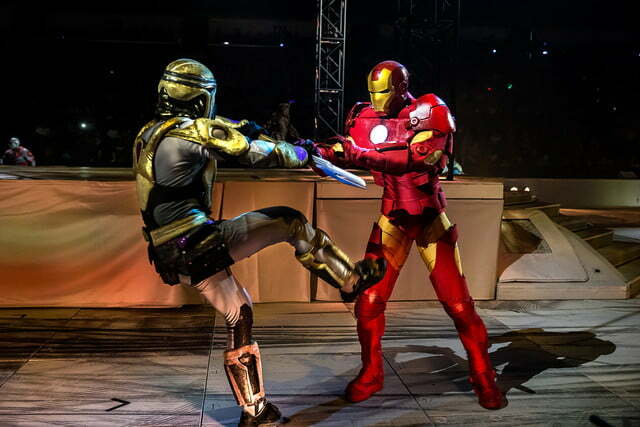 So, just how much authentic Marvel is in Marvel Universe Live? 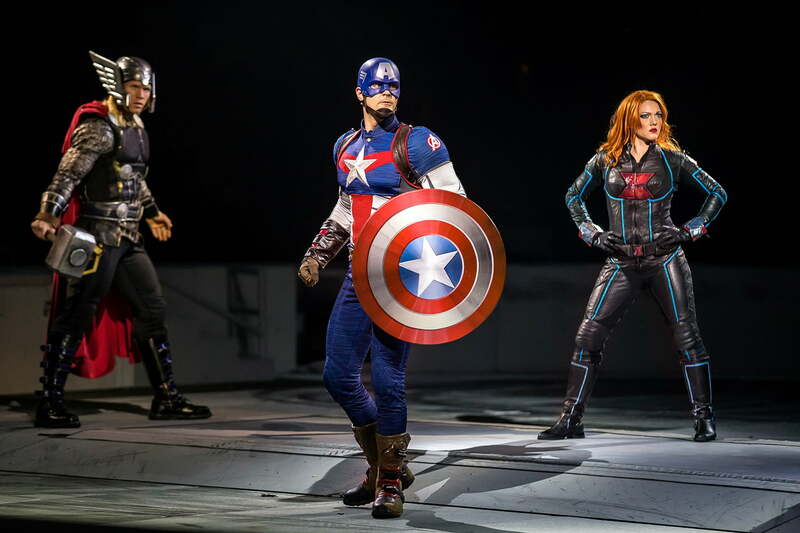 Digital Trends traveled to San Jose, CA to catch the Marvel Universe Live stop at the SAPP Center to find out. With Marvel, you are interested in the characters, but you geek out over the story. Fanatics flooding the internet debating fictional duels based on the rules established in the stories are a big reason the Marvel Cinematic Universe (MCU) continually pumps out box office hits. So, the Age of Heroes story was handled with extreme care by Feld Entertainment and Marvel. 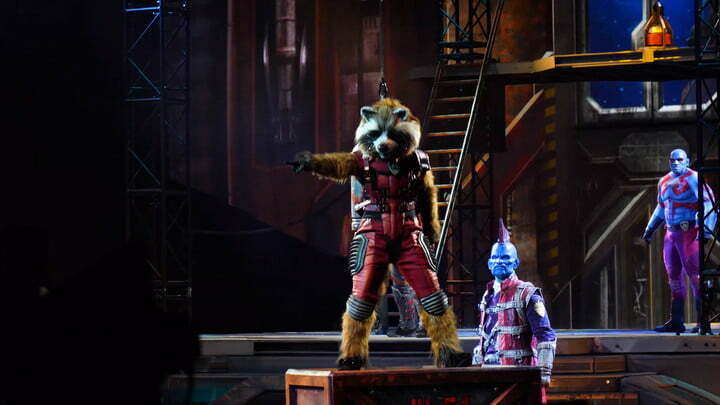 “The [Marvel Universe Live] story has been worked out for the last two years and a big concern was keeping the integrity of the Marvel Universe,” said Joshua Rothschild, Feld Entertainment’s company manager. The Age of Heroes story is serviceable and does its job of ensuring constant action and acrobatics between multiple popular characters. Fans may be bummed that Hulk’s involvement in Age of Heroes is 99 percent as Bruce Banner, since the scientist is imprisoned after Loki’s mind control powers prevent Banner from getting angry and turning into Hulk. But, the action Age of Heroes does offer is impressive and not easy to pull off seamlessly. What do you do when you can’t put mini-rockets in Iron Man’s feet, have webs shoot out of Spider-Man’s wrists, or have Doctor Strange manipulate reality? You use the closest thing humans have to superpowers: Technology. Marvel had a hand in coming up with the storyline, but Feld Entertainment and its designers handled and decided how they would bring these superpowers to life. It took a lot of blood, sweat, and stilts to turn actors into superheroes. 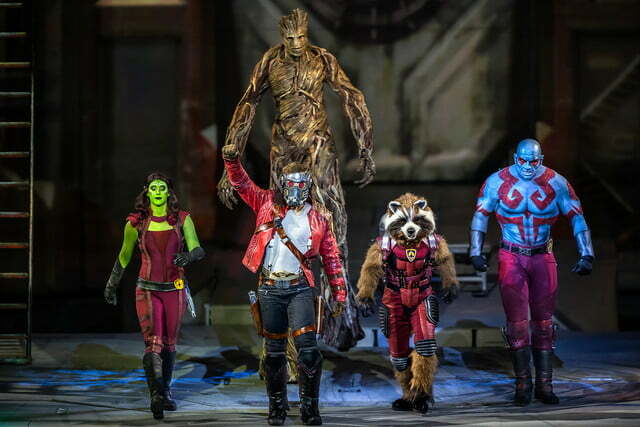 “The technology was decided on based upon what was needed for the show,” Marvel Universe Live video technician Brian Hanley told Digital Trends. “They decided ‘okay we’re going to need Iron Man to do this, so how are we going to make that happen?’ They tried different things. I know there was a lot of R&D [research and development] that was involved in trying different concepts, ideas,” Hanley said. All of the brainstorming and testing are on full display early and often during the show. Midway through the first act, a spinning disk of hot flares atop a yellow taxi cab amidst a battle royale suddenly stops and Doctor Strange appears with his arm extended, as if he collapsed it in his mystical hands. 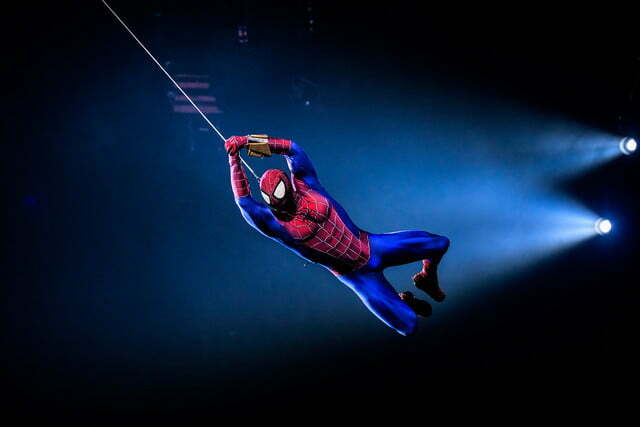 Signature superhero moments such as that one, or Spider-Man’s swinging from the rafters keeps eyes off phones and the energy high. Other attempts at recreating superhero magic were less dazzling. Before Spider-Man traps the Green Goblin in his signature webbing, the fight is choreographed to land in front of mechanisms that shoot a net on top of Spiderman’s green nemesis. 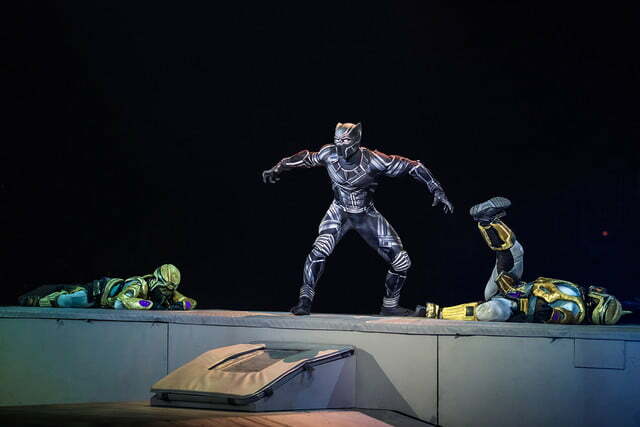 Marvel Universe Live takes place in a wide array of venues, including New York City, outer space, Black Panther’s home of Wakanda, and a mix of classic Marvel settings, usually transitioning from one to the other in a matter of minutes. 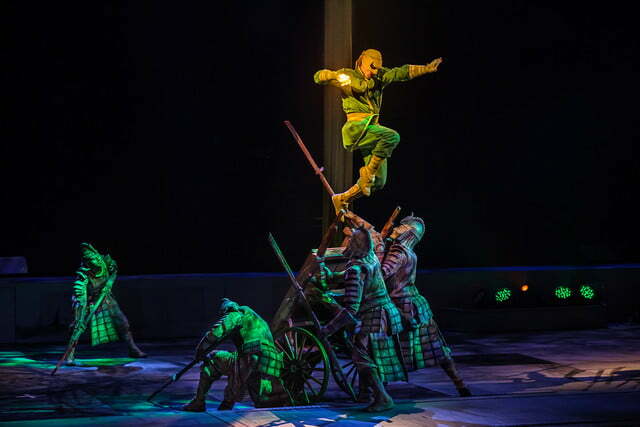 Similar to Feld Entertainment’s Out Of This World circus, the final Ringling Bros. tour, Age Of Heroes also uses projection mapping to turn the dull, grey floor into virtually any place in the Marvel Universe. For Age of Heroes, motion tracking devices were put on doors, so environments projected on the doors adjusted as the doors moved. 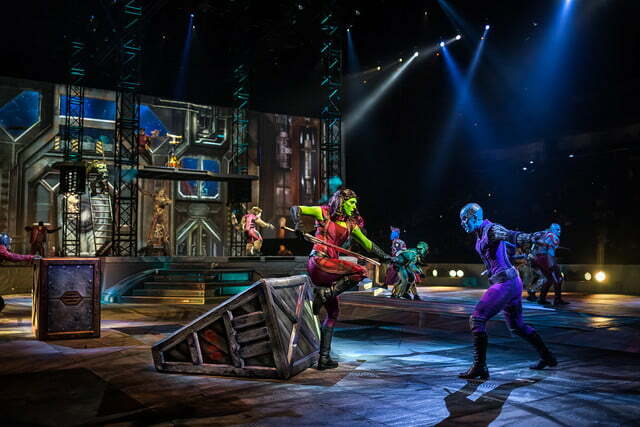 Those details may be overshadowed by the superhero fisticuffs and dirt bike chases, but they show that meticulous care was taken in transporting the audiences into the Marvel universe. That’s not just the tech, either. 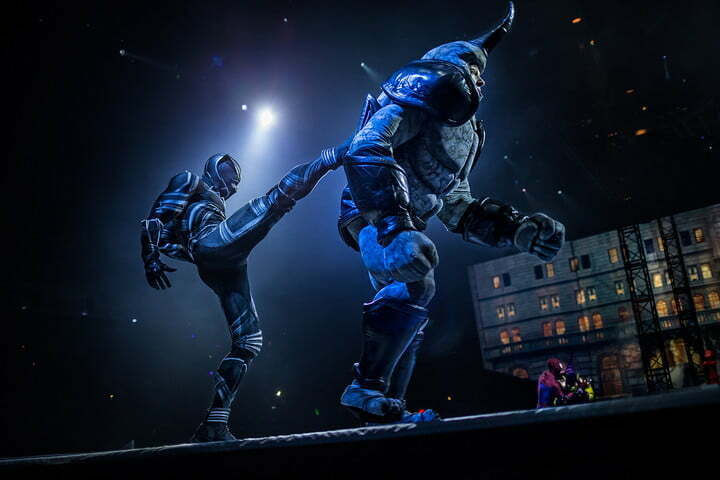 It took a lot of blood, sweat, and stilts to turn actors into superheroes. That Halloween training paid off as Libby was selected to join Age of Heroes after his third audition. Libby’s depiction of Groot charms the crowd and battles smaller foes on top of three foot stilts with such ease you forget there’s a person under all of that tree bark. Marvel Universe Live: Age of Heroes isn’t a Marvel adventure you can Netflix and chill at; it’s too engaging and there’s no rewind. 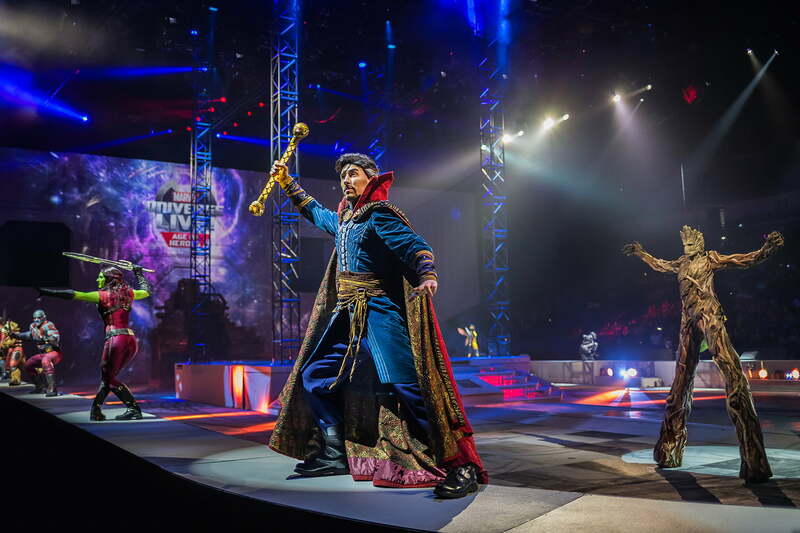 So, if you love seeing Marvel characters and want to watch an original Marvel story, then the circus-level theatrics of Marvel Universe Live: Age of Heroes is a worthwhile event for Marvel fans of all ages. 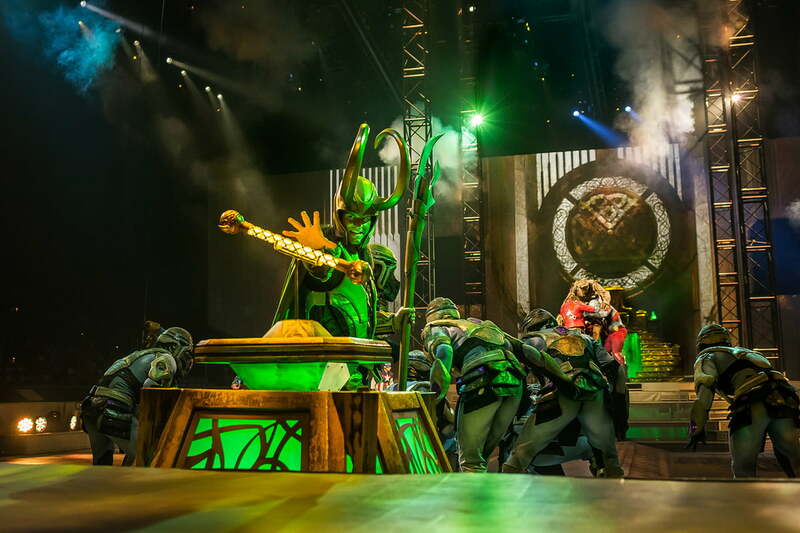 Marvel Universe Live will run until the end of March 2019, with tickets available online.